Ashley is PolishAddicted: 200 Follower Giveaway Time!!! OK, on to the goodies!! I changed my original plans for my giveaway prize, I'll be doing it for a giveaway in the future. I thought since this one came at this time of year it would be perfect to do a Christmas giveaway (I celebrate Christmas but if you celebrate Hanukkah, Kwanzaa or a different holiday I think you will still enjoy this prize as well)!! 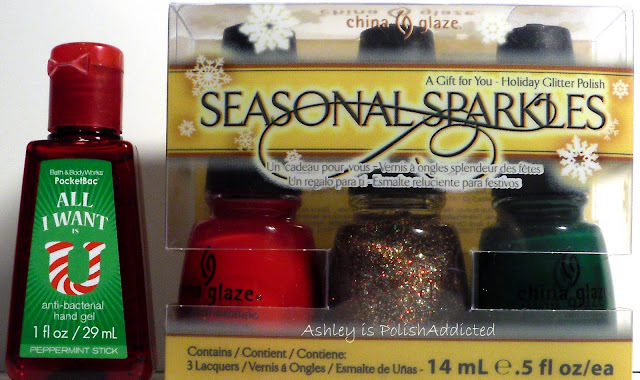 There will be one winner for this giveaway and they will receive the China Glaze Seasonal Sparkles Set which includes 3 full size polishes (Poinsettia, Holly-Day and the LIMITED EDITION Twinkle Lights!!!) and 1 Bath and Body Works Anti-Bacterial PocketBac in All I Want Is U (smells like peppermint YUM!!!)!! I hope you all love this prize, I think it's pretty fun!! Twinkle Lights is my favorite...red, green and gold glitter! I will be opening up this giveaway INTERNATIONALLY!!! You are welcome to enter no matter where you live! I am going to be closing this one much faster than my previous giveaway. Since these are Christmas-themes I want to make sure you have time to use them this holiday season so I will be closing this giveaway on Friday, December 9th at 11:59 PM MST (10:59 PM PST and 1:59 AM EST). I hope you all enjoy this prize!!! Thanks for making the giveaway international! Thanks ladies!! And you're welcome Victoria!! Thank you for the nice give away! congrats on 200+ followers and thanks for this awesome giveaway!